This fish is adorably called the dottyback. It’s not big. It’s not dangerous. It is cool, because it’s one of the few creatures that can change color at will. For a long time, scientists believed it did so to blend in with its environment. 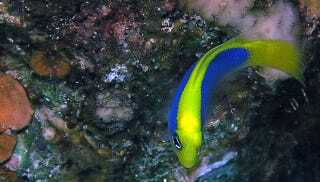 The dusky dottyback, for instance, could be yellow or brown. When it was put in a tank with brown coral, it turned brown, and when it was put in a tank with yellow coral, it turned yellow. Clearly, it wanted to lay low and escape notice. Then scientists tried putting it in with yellow coral, and it turned brown. The reason soon became apparent — the dottyback was in an environment with both yellow coral and brown damselfish, and the dottyback had a taste for damselfish young. This color change process isn’t immediate. They have yellow and brown pigment cells, and when they want to change from yellow to brown, they have to pull the yellow pigment into the center of the pigment cells, minimizing the color and initiating cell death. Slowly, brown pigment cells begin to grow in where the yellow cells once were. This takes a few weeks. During those weeks, the dottyback gets closer and closer to the school of damselfish... and then young damselfish start disappearing. The dottyback, three times more likely to catch a damselfish by subterfuge than by lurching out of the yellow coral, eats steadily, picking victims from the group that has accepted it. Eventually the damselfish catch on, and swim for their lives. But this is where the dottyback’s story really starts resembling a horror movie. Once it has worked out this great way to kill, it just moves on to a new school of damselfish, starting the deception all over again. Sure, the Dottyback only uses this one idea over and over again, but hey, so do most horror movie franchises. Image: Rob, Red Sea Explorer.